Mix all the above ingredients and marinate chicken for 4 hours or preferably overnight. Heat a pan and add chicken pieces with the marinated masala into the pan. Then cook on high flame until all water dries up and the chicken pieces become golden brown in color. Turn off the flame and set it aside. Heat the butter in a deep pan then add the chopped garlic, cumin seeds, cinnamon, cardamom and cloves and sauté until starting to brown. Now add ginger paste, tomato puree and 1 cup water and bring to a boil. Then add red chili powder, garam masala powder, ketchup and adjust salt. Cover and simmer for 10 minutes on low flame. Now add the chicken tikka into the pan and mix well with the gravy. Cover and cook it for 5 mins on low flame. Add honey and fresh cream into it and cook for another 5mins. Turn off the heat and sprinkle some chopped coriander leaves. 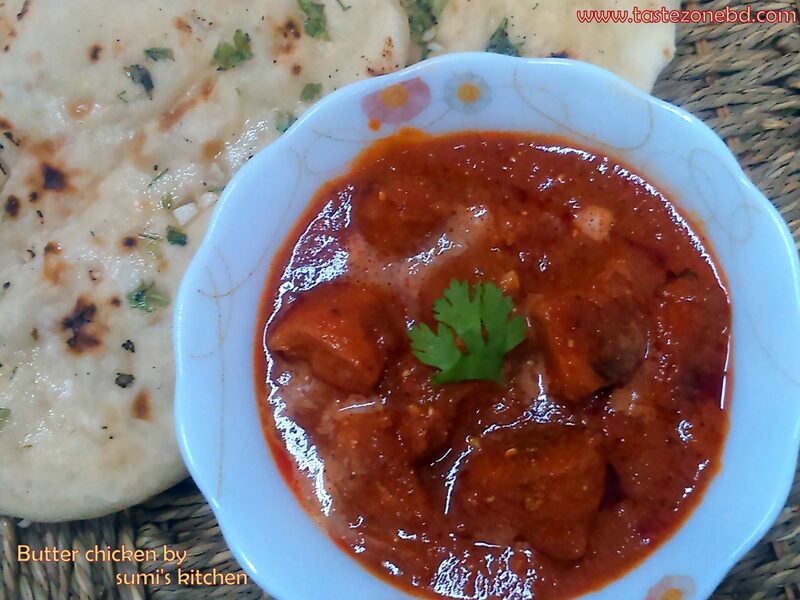 Switch off and serve with rice or butter naan.